STUDENT VOLUNTEERS NEEDED FOR CLEAN EXTREME 2019! 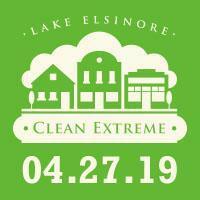 On Saturday, April 27, 2019, students are invited to be among 600+ volunteers for Clean Extreme 2019: Riverwalk! This year’s project is along the Lake Elsinore Riverwalk (AKA Lake Elsinore “outflow channel” multipurpose trail). Planned projects along the Riverwalk and surrounding areas include bridge and fence painting, mural art, weeding, and riverbank trash recovery. An opportunity to earn community service hours! Click here to Register! All student participants are required to complete and sign a release and indemnification form. This can be completed in advance, or on the day of the event. Children 17 & under will require a parent at check-in or they may complete this release and indemnification form in advance. All participants will receive a FREE T-shirt while supplies last, a FREE BBQ lunch at Swick & Matich Park, and vouchers for a FREE Storm Baseball game ticket. Clean Up Activities along the Riverside from Elm Grove to Chaney St. Follow Clean Extreme’s Facebook page for news, updates and reminders at https://www.facebook.com/LECleanExtreme/.